When many people hear the word Discipline, they think of punishment – the consequences for bad behavior. Discipline is so much more: it’s Prevention of problems – setting up an environment where your child can be successful. It’s Picking Your Battles – deciding which lessons are the most important to teach. It’s Teaching your child about the right way to behave (not assuming they were born knowing.) It’s Setting Limits – letting your child know when there is a problem and giving them the opportunity to correct it. Then, as step 5, not step 1, come Consequences. After consequences, we Move On – making clear to the child that their behavior was not OK with us, but they are! Let’s look at the 6 steps in more detail. There are lots of things we can do to set the stage for good behavior. It’s easier for your child to behave when they are well-rested and well-fed. It’s easier for your child to behave when you have predictable routines for your day and they know what’s expected of them. We can plan our activities so that each day the child has plenty of kid-friendly times and places where we can say yes to them – yes, it’s OK to run here, yes, it’s OK to be loud here, yes, you can touch and play with all the things here. Having this time will make the “No” times easier. Effective discipline is grounded in relationship. If your child trusts you, and trusts that you love them, discipline will be easier. A key step of prevention is to teach your child what to expect, and what is expected of them. It will take them a while to learn what is appropriate behavior for church, stores, the doctor’s office and so on. On your way to an activity, talk about what you will be doing, and how you would like them to behave. When some questionable behavior begins, think before you intervene. 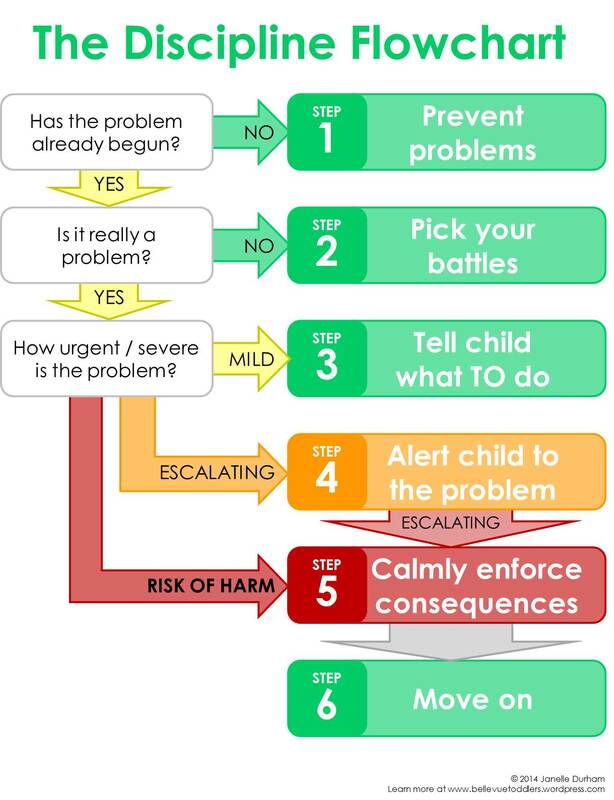 If something is clearly bad behavior, we move on quickly to the other steps… especially if there’s imminent danger of harm to a person or a possession – then we’d jump straight to step 5 – consequences. Or if your child is having a full-out tantrum, you may need to just remove them from the situation and explain later. But sometimes the ‘misbehavior’ that we notice and react to is really not that big of deal. Sometimes the behavior is just annoying to us but not really bad. (If this is the case, can you just ignore it?) Or sometimes, our kids just surprise us by doing something we didn’t expect them to do and we react negatively before we really think about it. And then next thing we know, we’re caught in a battle of wills about something, and we realize part way through that it’s a battle not worth fighting, but we don’t want to back down because then our child learns that they can out-argue us. When you encounter one of those moments of “I can’t believe she just did that!”, stop and think before reacting. Share your thought process with your child…. “hmm… I need to think about whether it’s OK to do that.” Once you’ve decided, explain your decision to them so you both know the rules for the future. We need to ask for the behavior we want to see. Toddlers don’t understand the word “don’t” very well, so if you say “don’t bite”, they hear the verb, and continue to bite. Also, even if they grasp what they shouldn’t do, they may not be able to think of any alternatives for what they should do instead. Tell them what they should do. Connect to Correct: Don’t call out suggestions from across the room. Go close to your child, establish eye contact, and then give suggestions. Engage them in the new activity before moving away. Note: don’t offer choices to a child who is very upset. It will only make it harder for her to calm herself down. A tantrum-ing child needs to be given clear direction about what to do. Remind your child what the expectations are and encourage her to behave better. Let her know what the consequences will be if the misbehavior continues. Don’t set any consequences you’re not willing to enforce! Your role is to be the authority who helps your child stay safe and grow into the best adult they can be. Although you can be loving and friendly to your child at all times, you can’t always be their friend. Sometimes you’ll be the “bad guy” who blocks them from doing what they want. No need to discuss this or re-hash it or re-negotiate it. Just do it. Once the consequence is complete (your child has calmed down enough to return to the situation or the time limit on taking the toys away has run out) then you move on. Remind your child you still love him– his behavior was the issue. Make plans together for how to prevent or manage this sort of situation in the future. Over time, we want our children to learn self-discipline, so as they get older, we need to “fade” back a little with our guidance. We ask them to tell us what the appropriate behavior is for a situation, we wait a little longer to correct, we let them experience some of the problems we’ve warned them about (instead of always protecting them from consequences), and take more responsibility for behaving properly. If you found this helpful, click on links on the right to “follow this blog” or “like me on Facebook” to stay up-to-date on posts. This entry was posted in Child Development, Discipline, Parenting Skills and tagged consequences, discipline, expectations, limits, preschool, toddler on July 8, 2014 by Janelle Durham.